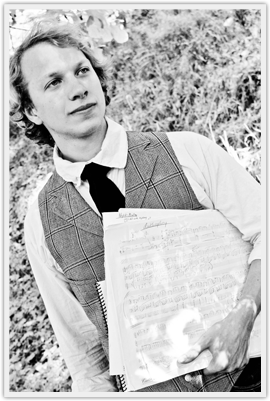 Justin Ralls, composer, conductor, and writer, hails from the Pacific Northwest and is inspired by the beauty of the natural world and elemental forms of creativity. Ralls’ works have been performed by a variety of soloists and ensembles including Albany Symphony (NY), Third Angle Ensemble, Roomful of Teeth, Fear No Music, Jarring Sounds, International Orange Chorale, Opera Theater Oregon, San Francisco Conservatory Orchestra, Esteli Gomez, Molly Barth and more. 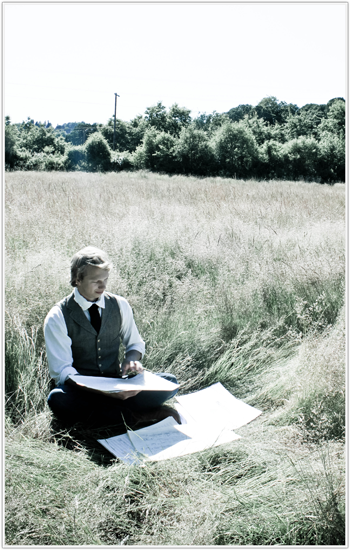 As a composer he explores an aesthetic plurality and eclecticism encompassing many styles including natural soundscapes, improvisation, electronics, vocal, chamber, film, jazz, folk and orchestral forces. In the summer of 2011 he produced, with his friend baritone Nicholas Meyer and pianist and conductor Robert Ainsley (Washington National Opera), a concert anthology of American Art Song, premiering an extended song setting of Walt Whitman’s Ashes of Soldiers; commemorating the sesquicentennial of the American Civil War, a subject the composer feels a deep sensitivity and passion. Ralls was the regional winner of Third Angle Ensemble’s inaugural 2012 New Ideas in Music Competition, conducting his winning work, Anthrophony, on two of the groups New Ideas in Music Concerts. In July, 2012 he participated in the inaugural Composing in the Wilderness workshop in Denali National Park, composing a piece while in the Denali wilderness for the Fairbanks Summer Arts Festival. Tree Ride, a piece for large orchestra inspired by conservationist John Muir, recently won the James Highsmith Composition Award, receiving its premiere by the San Francisco Conservatory Orchestra in the Fall of 2013. Tree Ride recently received Special Distinction in the 2014 ASCAP Rudolf Nissim Prize and was featured on the finale orchestra concert of the 2014 Fairbanks Summer Arts Festival in Fairbanks, Alaska conducted by Robert Franz. Tree Ride was also featured on Albany Symphony’s 2015 Composer-to-Center-Stage program of their American Music Festival. He steadfastly believes in the transformative and communal power of music to bring ideas and communities together, whether human communities or between humans and the natural world. Recent projects include an outdoor chamber opera, Two Yosemites, setting the 1903 meeting of John Muir and Theodore Roosevelt scheduled for a world premiere production in June, 2017 and a commission, Of Wolves and Rivers, from Landscape Music and Cadillac Moon Ensemble celebrating the 2016 centennial of the National Park Service. Ralls is an Artist-in-Residence at the H.J. Andrews Experimental Forest, an Old Growth forest research site, where he episodically composes, explores and holds concerts. Ralls’ educations includes degrees from The Boston and San Francisco Conservatory where he studied with Dalit Warshaw, Andy Vores, Jan Swafford, Dan Becker and David Conte. He is currently pursuing his Ph.D. at the University of Oregon under the mentorship of Robert Kyr. Ralls enjoys the outdoors, rock climbing, backpacking, and reading the works of John Muir and Joseph Campbell.